Carmen Jackinsky of Aloha, Oregon, wants to say hello and goodbye to the W55 race walk record over 50 kilometers. 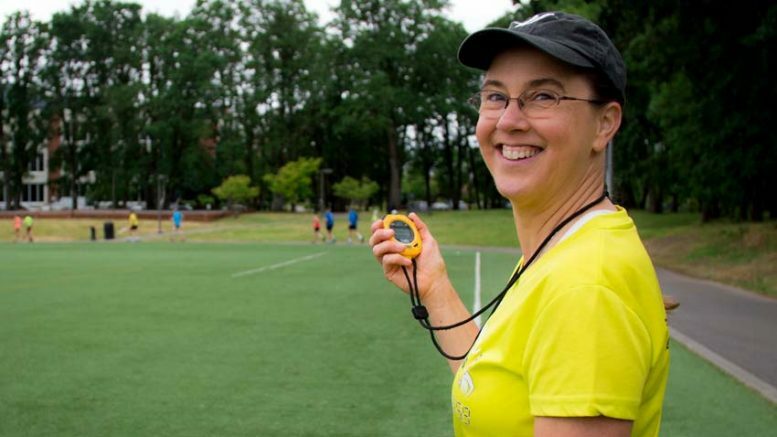 Carmen Jackinsky of suburban Portland, Oregon, is an inventor, coach and W55 race walker. Not sure which order she would use. But proving again that masters are far more interesting than kiddies, I point to my profile of Carmen in Times of San Diego. She walked funny as a child, she recalls, and was put in dancing. Then she wouldn’t stop hanging from a bar upside down and became a gymnast. Then she injured her back and was told she’d never be an athlete again. So she took up race walking. And then she decided to improve the design of race-walk shoes and started her own company, called ReShod. On top of all that, she’s hoping to walk close to an expected Olympic Trials qualifying standard of 5 hours, 45 minute a couple Saturdays from now in Santee. If she ducks under 6:31:52, she’ll be the W55 American record-holder for the 31-mile heel-toe stroll. Be the first to comment on "W55 race walker Carmen Jackinsky preps for 50K nationals, has Olympic Trials in mind"